While young adult peer support workers add great value to treatment teams, providers struggle greatly with both recruitment and retention. 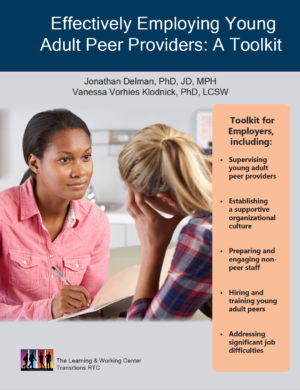 Effectively Employing Young Adult Peer Providers: A Toolkit was developed specifically for provider organizations that employ or want to employ young adult peer providers. It discusses the factors that promote the success of young adult peers within a provider organization.